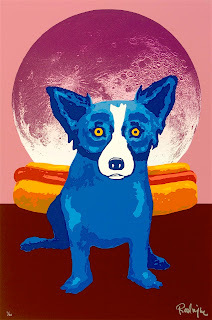 Yesterday morning I sat in the window of a Houston, Texas café, George Rodrigue’s sandwich order in hand, awaiting the counter change from breakfast to lunch. An Ignatius J. Reilly nearby spoke of high water and broken computers into what I first thought was a hand’s free phone but turned out to be air. “Damn this spilled coffee!” he shouted, looking at me. I shrugged, seeing nothing. He repeated his creed until I nodded in agreement, handing him a napkin which he tossed aside, grinding his teeth and abandoning his tray. As if on cue, Yusuf Islam, a.k.a. Cat Stevens, began "Don’t Be Shy" over the speakers of the now empty restaurant, sending me again into a helpless emotional state. 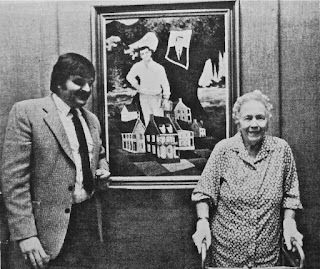 Adding to this surreal scene is our current situation, too private to share in detail, but real, the source of speculation and concern, the surprising “job training,” as my friend Barbara calls it, and the catalyst of a bigger life’s picture: family, legacy, and love. 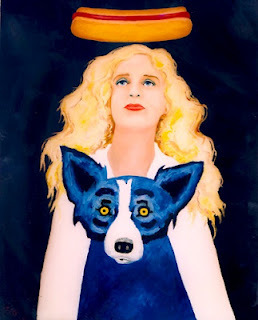 …started George Rodrigue as I shared my café-encounter. I laughed and grabbed my notebook at this unexpected sign of normalcy. “What! ?” he questioned, a bit too loud. I can tell he’s feeling better, because he’s telling me how I am, I wrote, before tuning out, at feigned attention, for the familiar analysis, my husband’s hands chopping the air as he dissects, for my benefit, my personality. George, begged my sentimental mood, tell me what you love. Shout it out. “What do I love?” he said quietly, and for him, almost shyly. Yes! What do you love? Don’t get philosophical on me. Just say it fast, all in a row. "I love Blue Dogs! I love LSU football! I love modern medicine! And more than anything in the whole world, I love to paint!" And in one word, George, how do you feel right now? “...Lucky," he said, without hesitating. "Make that damn lucky!" 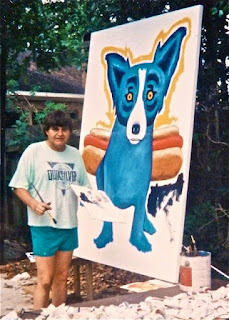 Have you ever painted a Lucky Dog vendor?, I continued, knowing his love of hot dogs. “I’ll make him a Blue Dog vendor and have him sell paintings from his cart,” he laughed, pulling out his sketchbook. ...he said last week, explaining the joy and interest of their daily visits, especially George’s stories* and philanthropy, both as appealing as his artwork. 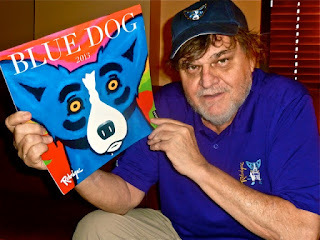 I listened, touched, to this American hero and made notes for this post, another chapter in the story of one lucky dog. “And in one word, how do you feel?” asked George, after reading my draft. Here's a footnote-slash-small world anecdote for you. Many years ago I went with Shirley Feibleman (Shirley Ann Grau) to Lafayette to see Maurice DuQuesnay. Maurice is deservedly rumored to have been the model for Ignatius. (Though Maurice claims to know who it really was.) Maurice had had George do a poster of Shirley for the Flora Levy series. At the end of a liquor-loaded dinner, Maurice gave me a signed copy of the poster, and Shirley signed it, too. And then...and then...Maurice fell over and got the most decorous small smear of his dinner in one corner of my poster. So I now own a poster signed by George and Shirley, with a forensically insignificant little patch of Ignatius slop almost hidden by the frame. A true collectible. Oh Patty, you gave us the biggest laugh! Thank you for sharing this terrific vignette - all the more fun because we know the parties involved. What a picture! Always enjoy your writing. We are so please to hear that things are improving. Your "I can tell he’s feeling better" was music to our ears!. You guys need to hurry up, Saints season is almost here and we need you guys at the Dome. I must share my heart. I'm am thrilled with the awesome reports. You call it luck I call it Grace. Grace is the unmerited favor of God. None of us can earn it and none of us deserve it. Last Sunday our Pastor was preaching on " Givin Living" It appears that some of us so called "Christians" need to be reminded about being generous. How crazy is that. As he read off different scriptures on the blessings associated with giving one really stood out to me and I Thought "Mr. George". Here it is Psalm 41:1-3 " Blessed is he who has regard for the poor; the Lord delivers him in times of trouble. The Lord will protect him and preserve his life; he will bless him in the land and not surrender him to the desire of his foes. The Lord will sustain him on his sickbed and restore him from his bed of illness." God's word is Truth. Jed and I don't know anyone more generous than Mr. George. Mr. George you are tasting and seeing the goodness of God. We love you both and Wendy I too am ... Grateful. Almost in tears with joy at this entire experience!! Oh, I am so glad I jumped on FB just in time to catch this rolling through my timeline. I wrote a quick analysis of the painting "Lucky Dog," and then saw the link to this blog. I am a very happy artist/woman/believer saved by grace myself! He did indeed deliver me from sickness, deadly e. coli which caused me to live in constant agony for nine years. But it was supposed to be for life! I am cured from the agony and got much more than just my life back. The nine years is how long I studied the Bible, finally got comfortable with God, and had the faith to believe He really can do absolutely anything. He likes to do it such that it is really fifty things in one thing, though! :) Nine years is long to suffer but short to get completely free of crippling pain! :D <3 Wendy, you are a wonder, truly angelic, and just could not be doing a better job at all of your endeavors. You are a great example of woman at her finest, able to endure and overcome, but humble and kind. These factors multiply together to make you so much more though. 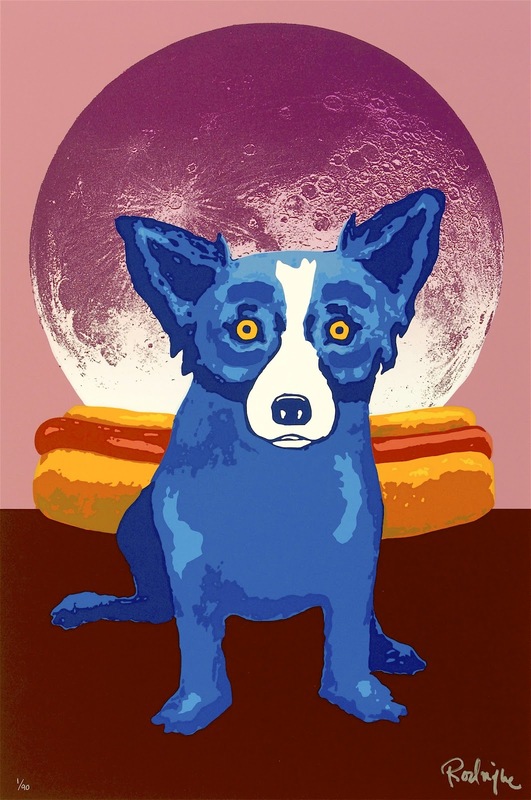 Your writing is excellent, the archival work an honor to your husband, and to art in general, and to New Orleans in particular. God richly bless and keep you, and I pray for healing and strength and most of all grace for you and all of yours. "WILL YOU MAKE ME ONE WITH EVERYTHING." I worked so hard today on my house and I get on FB to see this personal homage from the Rodrigue camp that just makes my mind swim. Something about the actual realities that reveal themselves through those who live the delta life create a deep seated envy in me, because of the rich pursuit that many in the delta exhibit on a daily basis. Hoping that I don't sound too cliche'ic and borrowing from a previous idea, Louisiana is a state of mind. Don't kid yourself.